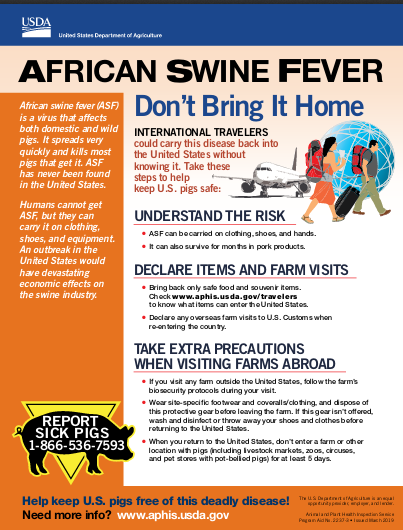 We've been following the devastating spread of African Swine Fever (ASF) in Eastern Europe, across much of China, and most recently in Vietnam for many months, and while this pig virus has never been detected in North America, the threat of seeing it arrive here someday is ever present. Last Saturday, in Feds Seize 1 Million Pounds of Illegal Chinese Pork Products In New Jersey, we saw the the largest-ever seizure of agricultural products in U.S. history; roughly 1 million pounds of smuggled pork products from China. 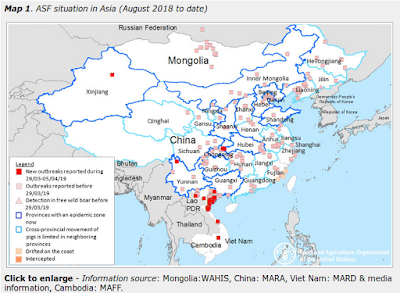 Contaminated food products - even those with cured or dried meat - can easily spread the virus to new regions, and may have contributed to the spread of ASF to - and across - China. While American farmers may have dodged a bullet with the seizure of hundreds of tons of potentially contaminated pork products, the threat remains. 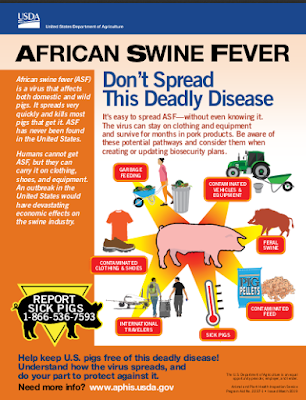 And as more and more countries are affected, the avenues for ASF's import to North America only increase. Today the USDA has released the following press release on the New Jersey interdiction, and of the combined efforts by many federal agencies, along with the private sector, to detect and intercept the virus before it can cause billions of dollars of damage to our agricultural economy.